National Geographic for Windows 8 designed for people who are into the National Geographic, who just love knowing new interesting things, covering the entire world. You can read latest updated News related to National Geographic, watch all latest trending videos, or view amazing photos, right within the app. You can also use images to set as your Windows 8 Lock Screen or just share them with your others via Email, from within the app. National Geographic has always been an excellent source for getting info related to our beautiful Planet. Its provides info related to geography, natural science, archaeology, environment, history, just everything, via articles, News, Videos, and Images. Also, National Geographic is a well-known TV channel that has been into existence for very long time. And, now it is available as a Windows 8 app at zero cost. What I really found interesting in this Windows 8 National Geographic app is its column-based tiles UI. As you launch the app, you will find three different categories placed in columns: News, Photos Of The Day, and Videos On YouTube. To view all the categories, just go towards the right (use mouse wheel or the horizontal bar). And yup.. the videos available in this National Geographic Windows 8 app is integrated with YouTube and it plays videos retrieved from the official National Geographic YouTube channel. Let me tell you.. video quality is superb, a very high-resolution video quality. As you open the ‘News’ category, it shows all the related articles at the left column, while the currently opened article in a big box. You can use the mouse-wheel to read the entire article. The article is again integrated with the official National Geographic website. The use of this website is that you wont not need to go through the browse to get all the latest updates, watch videos, etc. Let me quickly point out the main features of this National Geographic for Windows 8 below. 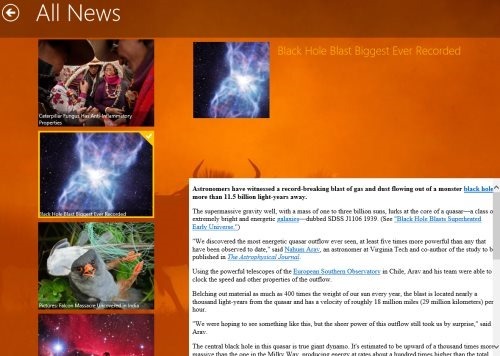 Lets you read all the updated News, view amazing images, and watch videos in HD quality. Lets you seat an image as Lock Screen background. Lets you share images with others via Email, from within the app. Lets you stay updated with National Geographic content. Videos are integrated with the official National Geographic YouTube channel. Well.. its Nothing. 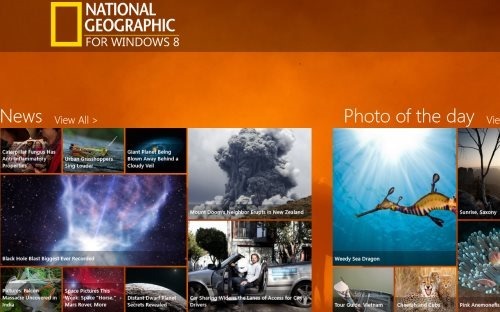 I loved just everything about National Geographic for Windows 8. It’s very simple to access, it provides all the latest updates in News form, lets you watch videos in HD quality, lets you view amazing images or set images as Lock Screen, just everything you would expect from an official Windows 8 National Geographic app. It’s a must-have app, if you are National Geographic lover..! Also, check out our posts on GPS App, News Apps, and Articles App. Open the link in Windows 8’s IE10. Soon, you will find it opened directly in Windows 8 App Store. Go ahead with upcoming downloading instructions. In Short, National Geographic for Windows 8 is an excellent source to get info about our amazing Planet. Go ahead and download National Geographic App Windows 8 now..